Within a 10 minute walk of Swanpool Beach via a shortcut footpath, and standing in an elevated position within popular Swans Reach on the south western outskirts of Falmouth, a 2009-built 4 double bedroom, 2 reception room detached family home, well presented throughout, enjoying a generous, level and enclosed rear garden, integral garage and driveway parking. Views of Falmouth Bay can be enjoyed, mainly from the first floor. A 2009-built 'Sandown' property, this four bedroom detached family home is light, spacious, neutrally decorated and well presented throughout, and provides modern two reception room accommodation over two floors, with the added attraction of solar panelling providing the existing/future owner(s) with an overall benefit/gain of approximately £1,000 per annum. Views across Falmouth Bay can be enjoyed from the two main bedrooms on first floor level and a glimpse from the dining room. On the ground floor, the living room features direct access to the rear garden, which is particularly level and family friendly , with space for a conservatory extension (subject to all necessary regulations). The kitchen features sufficient space for a small breakfast bar and benefits from a separate utility room with access to the side pathway. The separate dining room is situated to the front of the property and there is also a ground floor cloakroom/WC. 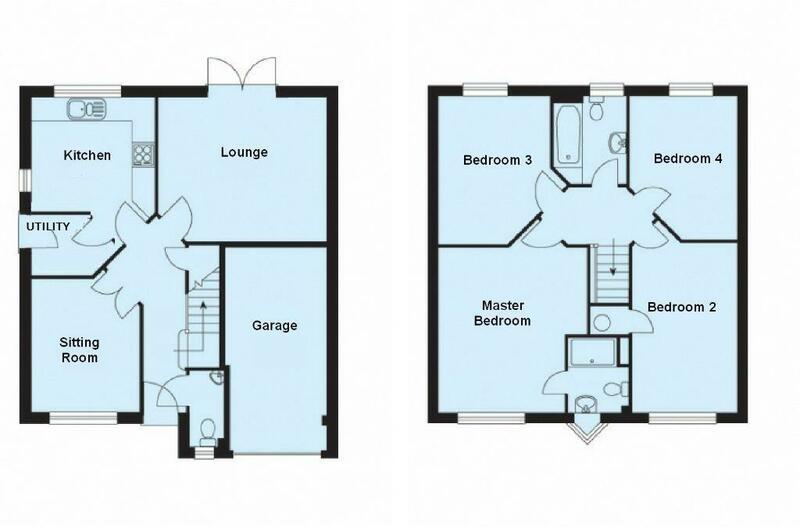 On the first floor, there are four spacious double bedrooms, including a master en-suite shower room, together with a family bathroom. Far-reaching views are enjoyed from the rear of the property. Outside, the rear garden is level, westerly-facing and mainly laid to lawn. There is also an area of decking which enjoys an elevated aspect towards Swanpool. To the front, a tarmacadamed driveway provides off-road parking for two/three cars, adjacent to which is an area of lawn which could provide further parking, if required. Paved pathways extend to either side of the property providing gated access to the rear garden. Swans Reach is situated within the sought-after residential area of Goldenbank, on the south western outskirts of Falmouth, close to surrounding countryside, beaches and golf course. A recently opened connecting footpath leads to the rear of Swanpool Lake which provides easy access to Swanpool Beach an approximate ten minute walk from the front door of the property. Day-to-day amenities, including primary and secondary schooling, are within a few minutes' drive; excellent shopping, commercial and leisure facilities in Falmouth town centre are easily reached, as are beautiful coastal walks to Gyllyngvase, Swanpool and Maenporth Beaches. Matching panelled doors to the cloakroom/WC, living room and kitchen. Broad double doors to the dining room and low level under-stair cupboard. Radiator. Stairs rising to the first floor landing. Low flush WC, corner wash hand basin. Radiator. Obscure double glazed window. A well proportioned living room with broad uPVC double glazed doors leading directly onto the level rear patio and generous garden beyond. Fireplace with marble surround, hearth and timber mantel, suitable for a modern electric fire. Broad radiator. Another spacious room with broad double doors from the entrance hall and large uPVC double glazed window to the front elevation with a glimpse of Falmouth Bay. Radiator. Maximum measurements provided of this conveniently positioned utility room. Space for washing machine, tumble dryer and additional freezer. Wall mounted gas fired boiler providing central heating and hot water. Further worksurface space and tiled splashbacks. Door to the side elevation leading to the front and rear gardens. Stairs rise from the entrance hall. Doors to all four bedrooms and family bathroom. A particularly spacious master bedroom with surprisingly clear views across Falmouth Bay and the inner waters surrounding Swanpool Beach. Broad uPVC double glazing to the front. Radiator. Recess suitable for a broad wardrobe. Measurements exclude door recess. Broad uPVC double glazed window with superb views across Falmouth Bay. Airing cupboard with slatted shelving. Radiator. Another spacious double bedroom with uPVC double glazing and enjoying elevated views across the rear garden and towards Falmouth town centre. Radiator. Yet another double bedroom with uPVC double glazing overlooking the rear garden and elevated aspect towards Falmouth town centre. Radiator. Featuring a low flush WC, panelled bath and pedestal wash hand basin. Obscured double glazed window to the rear elevation. Radiator. Featuring a tarmacadamed driveway providing off-road parking for two vehicles, which could be enlarged if required to one side, where there is a further lawned area. A most appealing, generous and extremely level rear garden, featuring a paved patio adjacent to the living room, rear decked area with elevated views towards Swanpool, and generous lawned area, particularly suitable for families and pet owners, with high secure timber fenced boundaries to the side, dry stone wall to the rear and much privacy to the rear aspect. Mains water, electricity, gas and drainage are connected to the property. Gas fired central heating. Vacant possession upon completion of the purchase - the vendors wishing to secure a particular property to purchase.